Volunteers with whale-rescue organization Project Jonah and DoC officials managed to send 100 or so whales back to sea on February 11th, only to have 20 wash ashore again. The remaining 80 joined another nearby pod, and appeared to be safe. However, that second pod then stranded itself on Farewell Spit that evening. The New Zealand Department of Conservation sent out a call for more volunteers, warning that it’s unlikely that they’ll be able to rescue all of the beached whales. While a few pilot whales become stuck in the shallows and on the shores of New Zealand each year, a mass stranding of this scale is almost unprecedented. About a century ago, 1000 whales stranded on islands off New Zealand’s east coast, while another 450 washed ashore in Auckland in 1985, according to a department of conservation news release. There haven’t been enough large scale surveys to know exactly how many pilot whales are swimming in the deep waters around New Zealand. But scientists do know that the van-sized creatures tend to live in matriarchal family groups of 20 to as many as 100 individuals. “It’s just awful, this one will certainly make a dent in the New Zealand pilot whale population,” says Liz Slooten, a professor at the University of Otago in New Zealand who studies marine mammal biology and conservation. 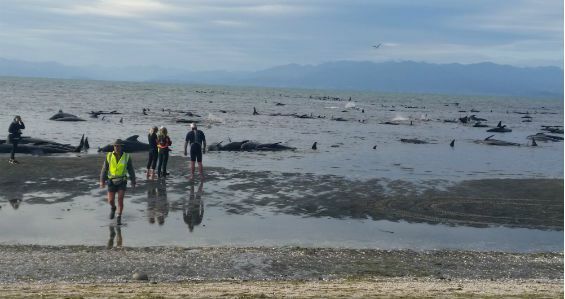 Pilot whales stranded on Farewell Spit, New Zealand. February 10, 2017. Pathologists are conducting postmortem examinations of the whales to try and understand what happened to make so many wash ashore. Because right now, the cause is still a mystery. Sometimes extreme weather, or unusual ocean floor topography can make the whales navigate into water that’s too shallow to leave. RIGHT NOW, THE CAUSE IS STILL A MYSTERY. Marine mammal strandings have also been linked to offshore oil and gas exploration, which use airguns to blast the ocean floor with sound waves. These can directly injure the delicate hearing that marine animals like whales and dolphins use to navigate, or panic them into surfacing too quickly or swimming into the shallows.